← In the city, tough plants go into the ground – Advice from a horticultural expert! Add a Red Lion to your life! Need a lift? Go get yourself a big, showy, pop of color! I suggest a Red Lion Amaryllis. I bought one a week ago at Trader Joe’s in the Back Bay for $6.99 (sorry no more left at that location) and have enjoyed watching it grow. Amaryllis love warm and sunny spots. It sure helps the spirit to see this red pop of color every day, especially when the temperature is below freezing and there are many inches of snow on the ground…. Just 57 days til spring! 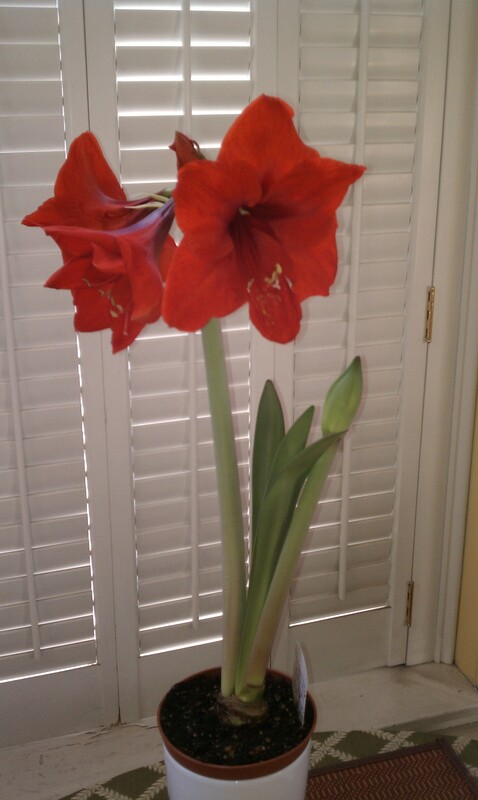 What a true jewel the ( Red Lion ) Amaryllis ! to watch this powerful flower grow during what can be such a dreary time of year!